October 7, 2018 By Allyson 8 Comments This post may contain affiliate links. Read my disclosure policy. 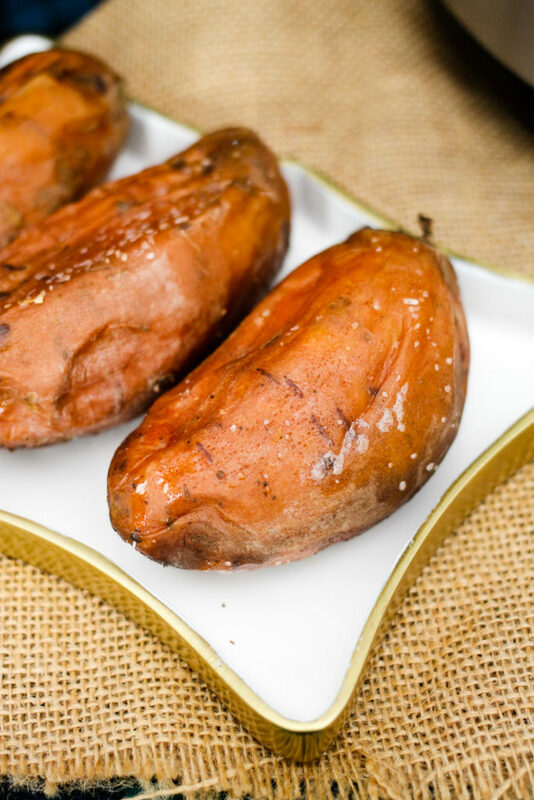 With the trusty Instant Pot, making sweet potatoes has NEVER been easier! Simply load the cleaned sweet potatoes into the instant pot, then set the timer and forget about it! The sweet potatoes are done in a fraction of the time traditional baking takes, and they are incredibly creamy and delicious! Like crispy skins on your sweet potatoes? 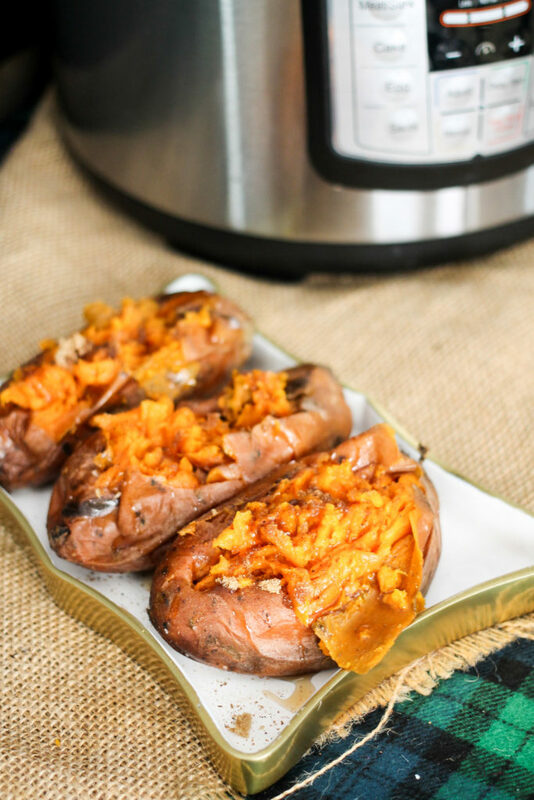 Pop them under the broiler for a few minutes and voila – crispy Instant Pot Sweet Potatoes! I’ve made potatoes millions of times, but trust me when I say using the Instant Pot is the easiest method! 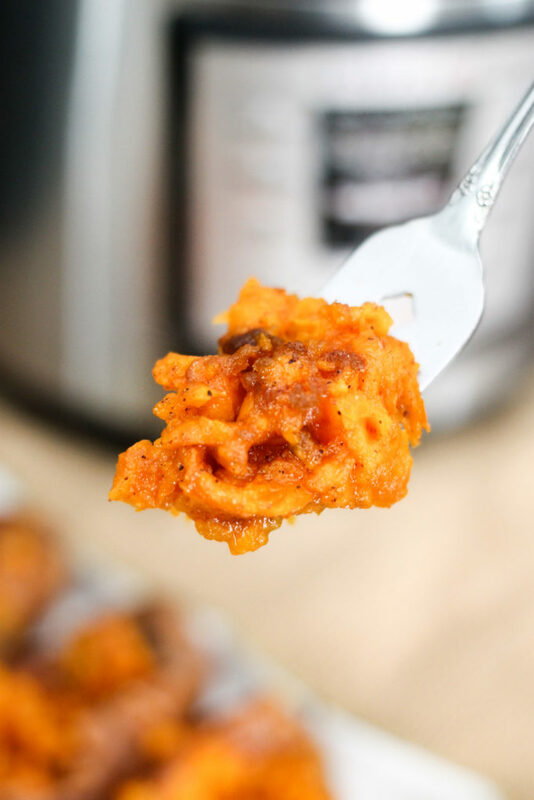 Eat these Instant Pot Sweet Potatoes for dinner, or serve them alongside side a main dish such as Bang Bang Chicken, Roasted Red Pepper Soup, or Chicken Noodle soup! 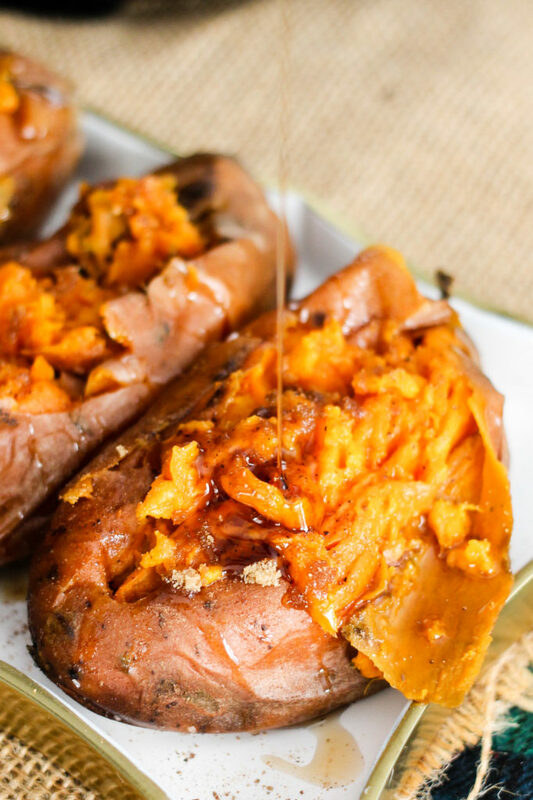 You can also use the instant pot sweet potatoes to make a delicious Southwestern Stuffed Sweet Potato, which is the PERFECT dinner! 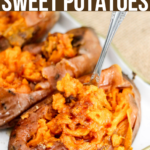 Use medium sized sweet potatoes for Instant Pot Sweet Potatoes. The cooking time will depend on how big the sweet potatoes are, so try to get sweet potatoes that are all about the same size. Clean the sweet potatoes! Make sure you scrub the dirt off the skins of the potatoes before cooking. Stab some holes in the potatoes with a fork. Add a cup of water to the bottom of the Instant Pot. Place the steamer rack or trivet into the bottom of the pot – you do not want the potatoes touching the water or they’ll get soggy. You can add as many potatoes as you want! Set the pressure to high/manual, and cook for 20 minutes (time will vary based off size) for medium sized potatoes. You should remember when using the Instant Pot, that the time it takes to cook the recipe (20 mins), is not the total time of the recipe. You need to give the pot some time to ‘come to pressure’. Optional: If you want crispy skins on your sweet potatoes, place them on a baking sheet and spray lightly with oil and sprinkle some salt on the skins. Place under the oven broiler for 3-5 minutes, keeping a close eye on them so they don’t burn. I love broiling them because I love eating the crispy skins! Serve with toppings or plain! I love using a bit of brown sugar, butter, and maple syrup – it’s like dessert! Are baked sweet potatoes healthy? YES! Sweet potatoes are super healthy, but you have to be careful about what you add to the top of the potatoes! Sweet potatoes are a rich source of fiber, which is great for digestion, as well as contain tons of vitamins and minerals including iron, calcium, selenium, and they’re a good source of most of our B vitamins and vitamin C.
One of the key nutritional benefit of sweet potatoes is that they’re high in an antioxidant called beta-carotene, which converts to vitamin A once consumed. Vitamin A is linked to anti-aging benefits, cancer prevention and the maintenance of good eyesight, according to the National Institutes of Health. While they do have a lot of carbs (about 23g for a medium/small potato), the health benefits definitely outshine the higher carb count. A medium instant pot sweet potato contains about 100 calories. This doesn’t count any toppings! There are tons of options when it comes to serving sweet potatoes. I mix it up between healthier options, and then sometimes splurge a little. Add a bit of brown sugar, butter, and maple syrup to the top of a sweet potato for a dessert-like treat. Whip up a Southwestern Stuffed Sweet Potato for the ultimate healthy meal. Use the sweet potatoes in some delicious vegetarian tacos. BBQ Pork Stuffed Sweet Potatoes:Combine 1 cup pulled pork, chicken, or beef with 3-4 Tbsp of your favorite barbecue sauce. Add more sauce as desired, and top with jalapeños, pepperoncinis, fresh cilantro, or chives. Italian stuffed sweet potatoes are covered in delicious marinara and cheese! YUM! Love the Instant Pot as much as I do? Checkout these awesome recipes! Clean the sweet potatoes, removing any dirt from the skin. Poke each potato about 5 times with a fork. Set oven on broil setting. Place potatoes on a baking sheet, and lightly spray with olive oil and sprinkle with salt. Place in oven. Cook about 3-5 minutes, or until skin has desired crispness. Carefully remove, and serve with desired toppings. Sweet Potato cooking time will vary depending on size. Try to find potatoes that are all around the same size (6 ounces/medium). If potatoes are larger, add a few more minutes to cooking time. If potatoes are smaller, reduce time a few minutes. This is fantastic!! I can’t wait to try it! Looks like such a tasty way to serve sweet potatoes. My family would like them as is, but I would definitely want to crisp up the skins. That’s my favorite part! Oh how delicious this recipe looks! My whole family would go crazy for this, it’s just incredible! This is one of my favorite recipes! 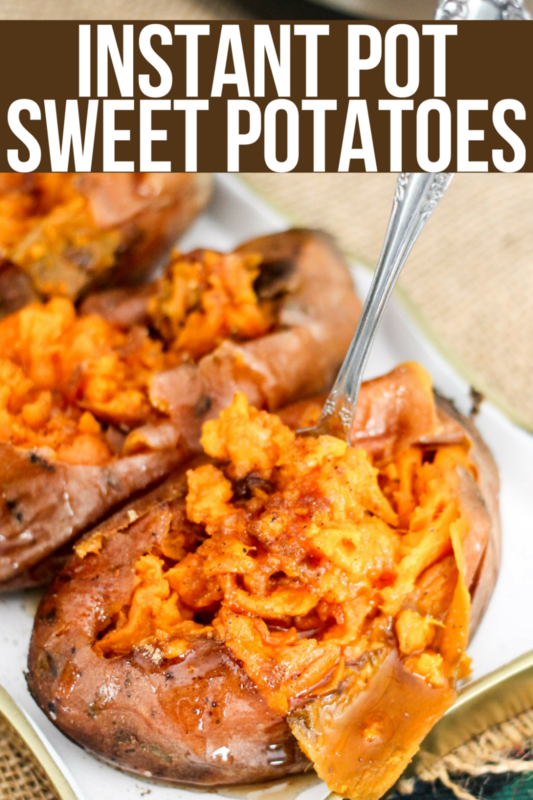 Definitely I will make sweet potatoes in my Instant Pot for Thanksgiving! Such an awesome idea!! I LOVE it!! Can’t wait to try this! I love using my instant pot! I can’t wait to make these! These look so fun and tasty! These are on my must-make list!